The Ivy House, Traditional House In The Heart Of Kalkan Old Town. Property 13: The Ivy House, Traditional House In The Heart Of Kalkan Old Town. Romantic Hideaway in the heart of the Old Town with stunning roof terrace. Property 23: Romantic Hideaway in the heart of the Old Town with stunning roof terrace. Three bedroom Villa with Private Pool and Good Sea Views at a Reasonable Price. 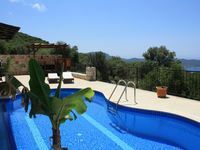 Property 38: Three bedroom Villa with Private Pool and Good Sea Views at a Reasonable Price. We have greatly enjoyed Kaş, the comfortable house and the heartwarming welcome by Axel and Jeanne, the homeowners. Villa Kekova is built according to their wishes. They opted for German solidity with high quality materials and Turkish traditional details. All wooden ornaments, such as the louvre doors and windows and the paneling, are handmade. This also applies to the sun beds. It all adds up to the special atmosphere of this new villa (built in 2012). Outside you have a spacious terrace with a beautiful view over the bay of Kaş. In the swimming pool you cool off nicely, there is an outdoor shower and together with the sun beds you do not have to leave the house. Although, maybe to get groceries. At the weekly market on Friday you can buy the most fantastic fruit and fresh vegetables. The atmosphere on the market is as pleasant as everywhere in Kaş. Old Turkish ladies sell fruit and vegetables from their own garden. What if you do not feel like cooking? Eating out in Turkey is a great pastime and compared to the Netherlands it almost costs nothing. Our big favorites were the restaurants at B&uuml;y&uuml;k&ccedil;akıl Plajı, such as Ada Beach and Mermaid Beach. If you eat there, a sunbed and parasol are included. From this bay I walked a short distance of the Lycian Way (in Turkish: Likya Yolu, follow the signposts and the red-white signs). I walked to the next bay where Nuri's Beach Bungalow is located. The one-way walk took me about 75 minutes. There are no motorways to Nuri&rsquo;s Beach: you have the choice to hike back or take a boat to Kaş. Our hosts Axel and Jeanne made our stay in Kaş really special. They were helpful, very generous and reassuring. When we indicated that we wanted to go horseback riding, they sought a riding school for us, took us there (the riding school is in &Ccedil;ukurbağ) and we made a nice trip on horseback of 2 hours. We also made a private boat trip with our own captain in the bay of Kekova. The captain's wife prepared an extensive, delicious lunch for us. Jeanne speaks Turkish which creates a nice contact with the locals. Altogether we had an unforgettable week in beautiful villa Kekova in, what we consider, the nicest part of Turkey.